56 athletes from 13 countries took the stage in Planica today with official training and provisional competition round. 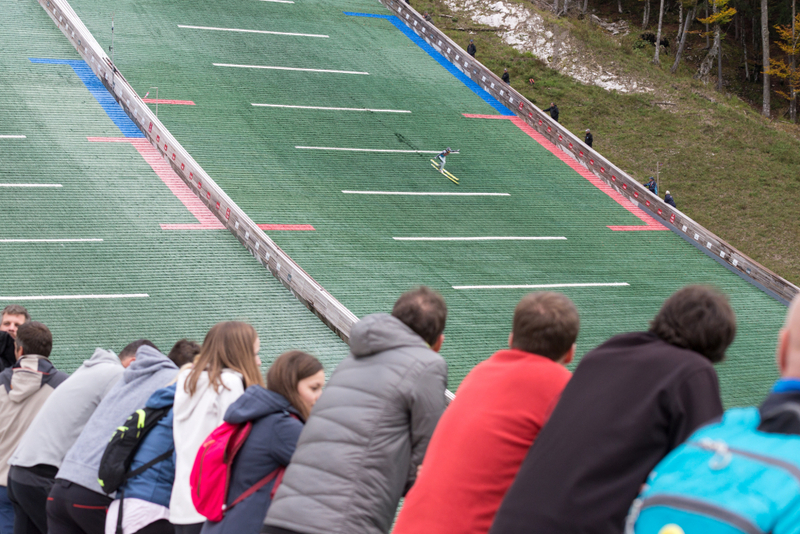 The first FIS Summer Grand Prix Nordic Combined event on Slovenian ground started at 15.00 with official training on the 139-meter Bloudek giant. The best jump of the two rounds belonged to Estonian Kristjan Ilves with 136.5 m and 145.8 points. Home favorite Marjan Jelenko made the longest jump in the first round with 130.5 m.
Provisional competition round finished with the jump of the day by Ilves who landed at 138.5 meters (132.0 p) The Estonian was followed by three Frenchmen Maxime Laheurte (128.9 p, 137.0 m), Laurent Muhlethaler (125.8 p, 133.0 m) and the legend of the sport Jason Lamy Chappuis (123.8 p, 137.0 m). Leon Šarc was the best Slovenian representative with 131.0 meters (110.7 p) and 18th place. Afterwards the athletes tested the cross-country tracks that will determine the seasons overall winner on Sunday. Tomorrows competition – seasons penultimate – will start at 9.00 with the trial round. Entry to the competition is free of charge.